On our first day in Moss Landing, driving over Jetty Road, I saw a band of White Pelicans standing in Elkhorn Slough. They were the first white ones I ever saw, and the rest of the time that we were in the Salinas area, there were only Brown Pelicans visible. 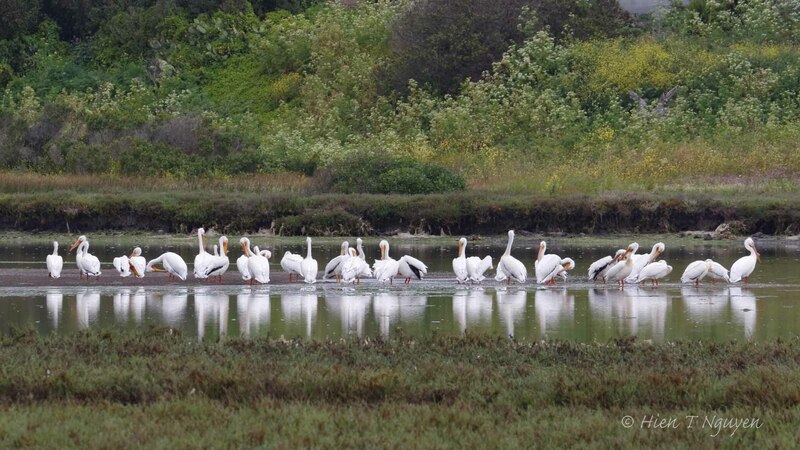 White Pelicans in Moss Landing. 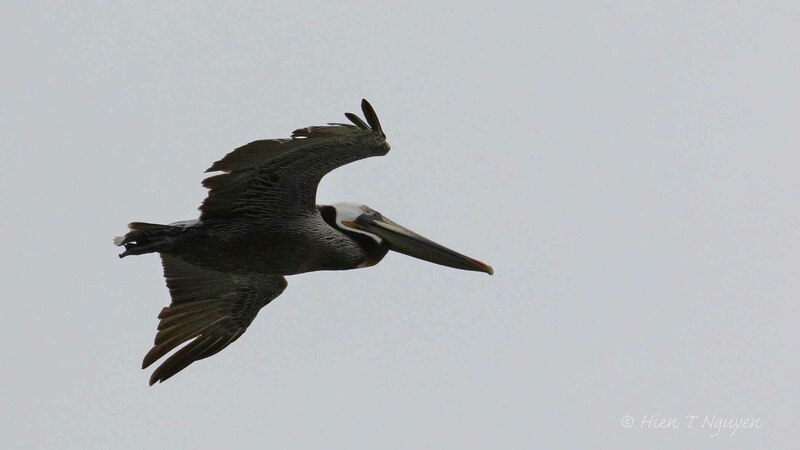 Brown Pelicans flew almost all the time above us, in squadrons or solo. They were at Moss Landing, Garrapata State Park, and all along that windy road down the coast to McWay Falls. 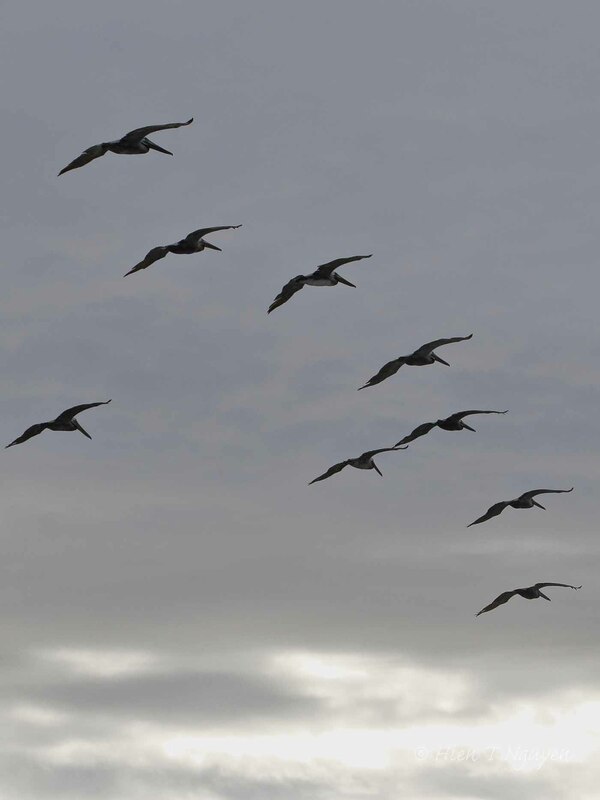 Part of a squadron of Brown Pelicans flying over the beach at Moss Landing by Jetty Road. Some were giving surfing lessons to humans. Surfer at Moss Landing beach. Surfer at Moss Lading beach. 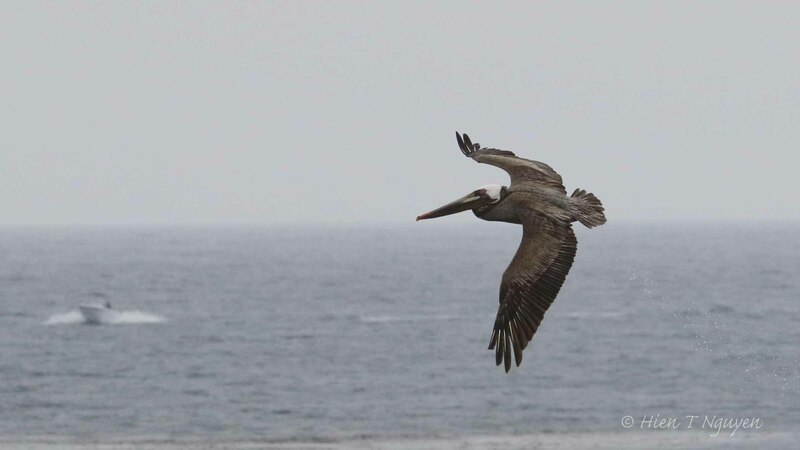 Brown Pelican over Garrapata State Park. Very nice! I’m enjoying sharing these experiences – the White pelicans (and the brown) the surfers, etc. Thank you Doda! We saw the brown ones everywhere we went along the coast. The white ones only appeared once. i have never seen them close. magnificent birds! I’ve never seen white pelicans before. Beautiful shots! Thank you Gina! They are beautiful birds, especially as they stand together like that. Beautiful photos of both the white and brown pelicans! 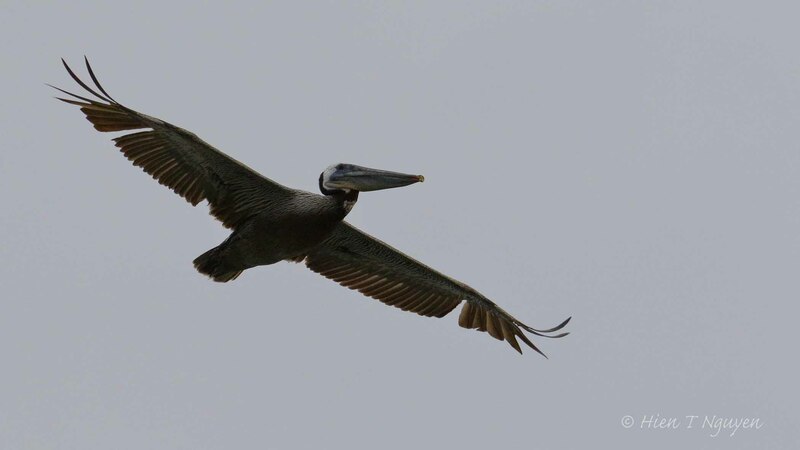 These are awesome flying pelican captures! We have lots of white pelicans here, I haven’t seen brown pelicans. Thanks Amy! I was surprised to see the white ones in Northern California. Perhaps the wet winter had opened up new fishing grounds for them. I love how the white pelicans lined up for a most wonderful photograph! What a capture, Hien. Thank you Lois. You are right about that white pelican shot. I am thinking of printing it out in large size and hanging it on the wall. Thank you Sue! Those brown pelicans were indeed buzzing the surfers repeatedly. Another interpretation is that they wanted people to get out of their fishing waters!